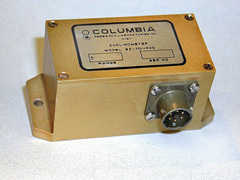 The Columbia Models SI-701FND is a premium performance force balance inclinometer designed to yield exceptional performance and long life under extreme shock and vibration conditions. A fluid-damped sensor system makes this sensor virtually uninfluenced by shock and vibration encountered in the most severe applications. The Models SI-701FND inclinometer is capable of producing accurate tilt data in the presence of vibration which would saturate most other accelerometer-based sensor designs. The closed loop servo system maintains scale factor and zero bias stability over the entire operating temperature range. Consult the factory for customized versions of these sensors. +15 VDC 20 mA Max.